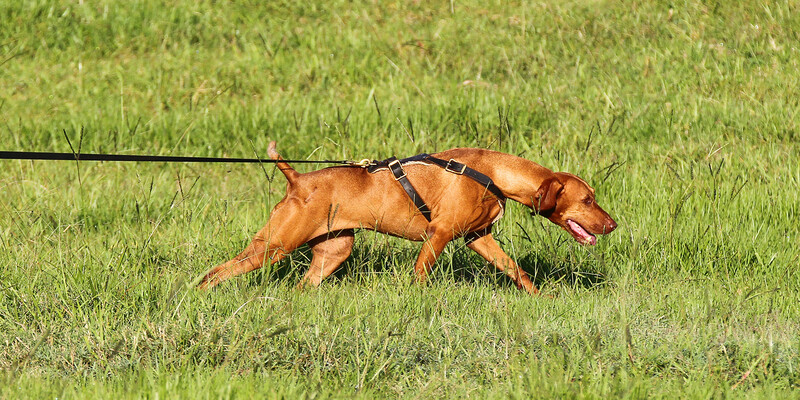 A dog’s ability to follow a scent trail or track is well known. Man has utilised this ability for centuries. Tracking is something that all dogs can do. It is a natural instinct for a dog to use this ability. The dog’s tracking ability is extremely acute. 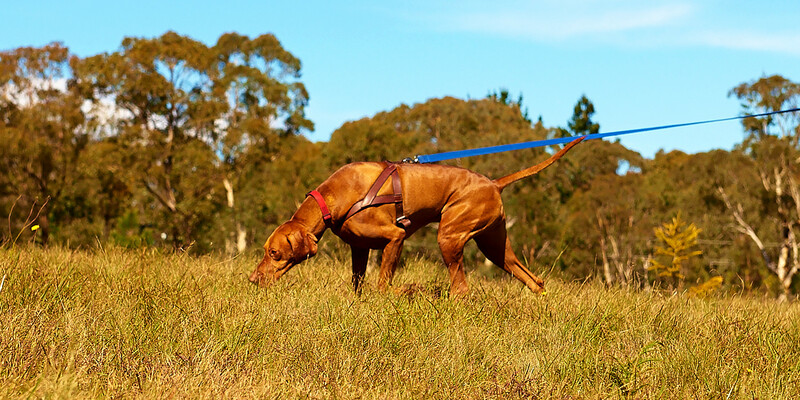 Vizslas use their native tracking instincts when doing what they are bred for – looking for birds. We don’t have to teach a dog to track; we use their natural instincts to teach them that we want them to follow a certain track. 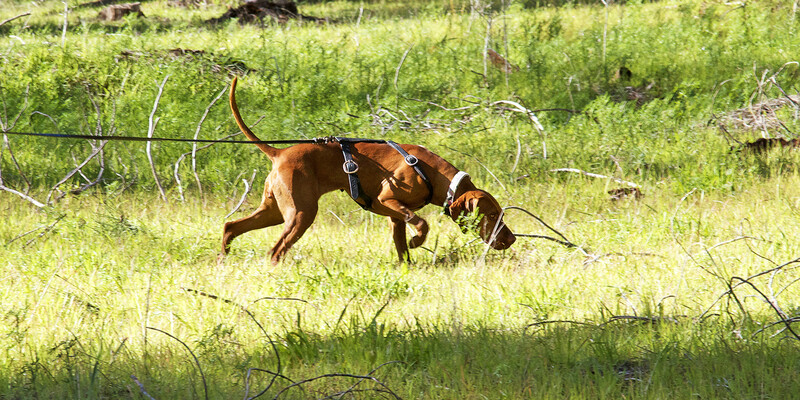 In Australia, most tracking dogs and owners are involved in tracking as a recreational sport. The most common way to start in tracking is to initially attend a seminar or course. Because of the time and space needed for training, most people tend to do a lot of their training on their own or in small groups. However you train, you will be constantly surprised at the ability of your dog to track and differentiate various scents. The equipment requirement for tracking is minimal. 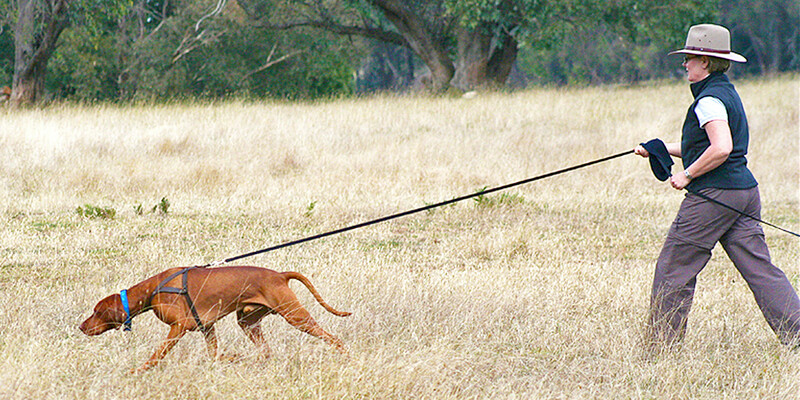 The dog is required to compete in a harness and lead with a minimum length of 10 metres. Tracking trials are quite often held over 2-3 days and can be held on farmland or bush areas. Trials are held in the cooler months of the year when snakes are not active. In a tracking trial, a track-layer walks along a course marked the previous day with ribbons, poles, etc. The track-layer collects all the ribbons and poles so no one can see where the track is and the only markers are at the beginning and the end of the track. Tracking trials start with the shortest track of about 400 meters (Track 1), up to the most difficult about 1200 meters with 6 direction changes (Track 7). The dog will start the track between 90-180 minutes after the track-layer walks it. All tracks have articles (often socks) left on them by the track-layer and in all tracks (except Track 1), the dog must indicate the articles and follow the track to the end to gain a pass. Titles currently available in this sport are Tracking Dog (TD) / Tracking Dog Excellent (TDX) / Tracking Champion (Tr Ch). The HVC of NSW runs a tracking workshop and a tracking trial each year. If you are interested in having a go at this this addictive sport or want to find out more, contact Ros Leighton, who has Vizslas who are Tracking Champions.